Are you looking for an energy efficient way to heat your Northern California home or office? Wing Solar & Wood Energy, Inc. can install a new radiant heating system for you. 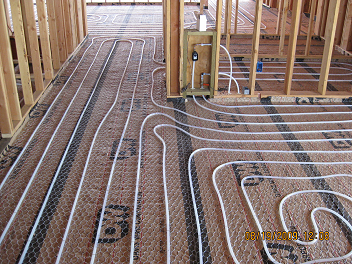 Hydronic radiant floor heating is the most comfortable and efficient way to heat your home or building. Below you will learn further about the many benefits of hydronic heating and why hydronic heating is your heating solution. Hydronic Radiant Floor Heating is much more comfortable because it provides a non intrusive heating system that matches your body’s comfort levels. The Hydronic Radiant Floor Heating System is hidden so that it allows a totally unrestricted floor space. Forced hot air from traditional furnaces dehumidifies your home, causing dry nasal passages and even damage to furniture. Radiant heating, on the other hand, keeps you comfortable by warming tile and wood floors from the ground up without blowers, fans or wasted energy. Hydronic Radiant Floor Heating Systems are virtually invisible, silent and unnoticeable because they are installed into the sub-floor of your home or office. Hydronic Radiant Floor Heating Systems are healthy because dust and pollen does not get blown into the air. Hydronic Radiant Floor Heating Systems are highly efficient because they spread heat evenly throughout the home instead of having hot/cold spots from room to room. We have extensive experience in repairing radiant heating systems, so if you have a modern house with a radiant heating system you can rest easy knowing Wing Solar & Wood Energy, Inc. can relieve your heating issues efficiently and affordably. With hydronic radiant heating there are no vents in the way of your furniture design and no forced air to stir up dust or make noise. Furniture can be placed anywhere without intrusion. Any type of floor covering can be installed over these systems. There simply is no match for radiant floor heating. 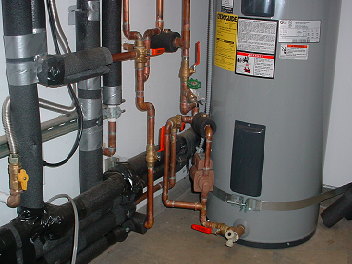 Our Hydronic radiant heating systems warm homes, businesses, warehouses, and garages, casinos, hotels medical facilities and much more. It can be easily installed in new construction and retrofitted into existing structures. If you are interested in installing a dust-and-allergen-free style of heating in your home, come to Wing Solar & Wood Energy, Inc. prompt, affordable, and honest service. 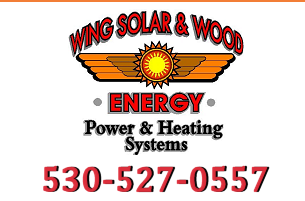 Enjoy the comforts of a Wing Solar & Wood Energy, Inc. heating system today by calling toll-free 1-800-492-4061. For your convenience, you may also request more information from this site.